A new research paper (see abstract below) on the behavioural patterns of forest elephants has dealt a major blow to the myth of ‘sustainable logging’ in the rainforests of the Congo Basin. One of the areas specifically referred to in the paper as being negatively impacted is covered by the concessions of Congolaise Industrielle des Bois (CIB) that is currently being ‘pre-assessed’ for FSC certification by Rainforest Alliance SmartWood. CIB has already gained FSC certification for two of its five concessions in northern Republic of Congo, which together cover 1.3 million hectares of once pristine rainforest. The earlier two concessions were certified by SGS, and it is not known why CIB has decided to now switch certifier. Although SmartWood has circulated notices of its intent to carry out a ‘pre-assessment’ of CIB’s Loundougou concession from December 2nd-9th, the company does not feature on the Rainforest Alliance’s website under ‘ongoing assessments’, and neither is there a Country Certification Assessment Standard for Congo. Exactly what SmartWood is conducting its ‘pre-assessment’ against is therefore not known. The forests of northern Congo feature ‘bais’, forest clearings which are important gathering and watering areas for elephants. Their migration to and from these areas is impeded by logging roads, which also make them highly vulnerable to poaching. Unfortunately for SmartWood, which is no doubt relishing the prospect of breaking into the potentially highly lucrative Congo Basin certification market by issuing the new CIB certificates, the elephants of northern Congo are amongst the most researched in the world. Numerous studies have shown how they play an absolutely critical role in the forests’ ecological processes, such as through the dispersal of tree seeds in their dung, and creating disturbed areas in which forest plants can regenerate. The Wildlife Conservation Society, which has led much of the research in northern Congo, has decribed the role of elephants as being akin to ‘forest engineers’. Any process, such as the building of logging roads, which serves to threaten the distribution or activities of forest elephants, is a major threat to the ecological balance of the forest itself. The new research shows that elephants are critically limited by the opening of roads which they are highly reluctant to cross, particularly those outside strictly protected areas, and therefore retreat to un-roaded areas. Closely linked to the problem of logging roads is the threat posed by hunting by logging workers. CIB’s ‘sustainable logging’ has involved the growth of its main logging base at Pokola, formerly a village of around 150, to nearly 20,000 people. Despite what the company claims to have been efforts to substitute frozen beef for wild-caught meat, many local inhabitants remain reliant on bushmeat, which is also culturally preferred by CIB’s workers and their dependents. Smuggled elephant tusks can also yield vast sums of money in relation to logging wages. According to a 2002 report for the World Bank, “wildlife has been largely decimated in a 20km band around Pokola”. Embarrassingly for CIB, a 2006 report (pdf file, 171Kb) by the International Tropical Timber Organisation found evidence of “hunting activities exercised as a prerogative of CIB employees who are transported by cars to hunting grounds that indigenous populations cannot reach on foot”. Research has already shown that there are only one-quarter the number of elephants in the peripheries of the Ndoki national park – which are largely occupied by CIB concessions – as there are within it. Given all this, and the new evidence, SmartWood will have no choice but to refuse CIB a certificate on the grounds of non-compliance with FSC Principle #6, which requires that “Forest management shall conserve biological diversity and its associated values, water resources, soils, and unique and fragile ecosystems and landscapes, and, by so doing, maintain the ecological functions and the integrity of the forest.” As any forest ecologist or conservation biologist will be able to tell SmartWood, no Congolese forest can retain its ‘ecological functions and integrity’ if it has been stripped of forest elephants and most other wildlife, and indeed has had almost all the large emergent trees of dominant species such as sapele (Entandrophragma spp) removed. Map showing elephant study areas. The large black area in the top right is an area that ceased to be ‘roadless’ during the period of the study. It is largely the Loundougou concession of CIB (see below). Map from World Resources Institute/Global Forest Watch shows location of CIB concessions to the south-east of the Ndoki National Park (click on the image for full size view). The new research also presents a test for Greenpeace, which supported the certification of CIB’s first concession even though, as FSC-Watch reported at the time, the company appeared not to have addressed numerous issues which Greenpeace had identified in the field as being non-compliant with the FSC’s requirements. 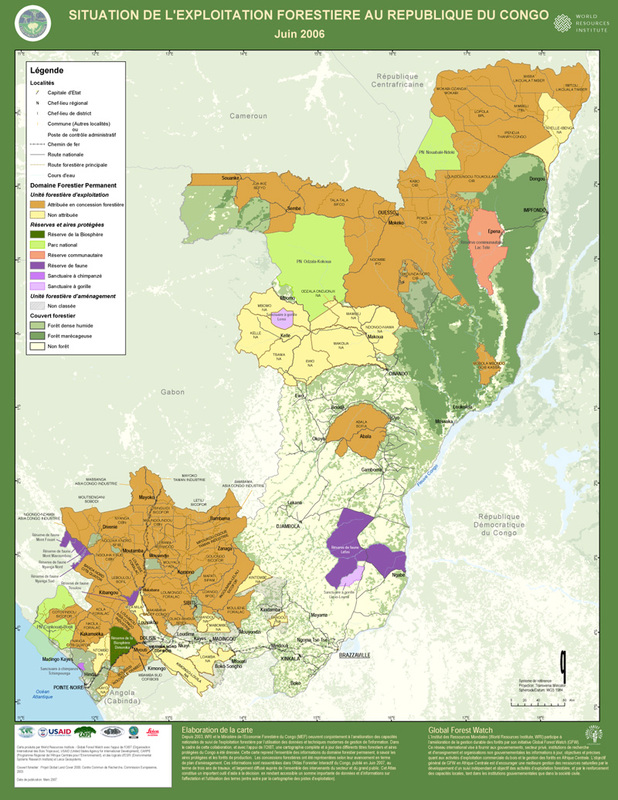 Back in 2004, Greenpeace was worried that new logging infrastructure, including a large new sawmill, roads and workers’ houses, to be installed by CIB in the Loundougou concession would have negative impacts within the adjacent Ndoki national park; the new research indicates that this is indeed the case. Since then, Greenpeace has opened a new Congo Basin office in Kinshasa, which focuses on the protection of the region’s rainforests. Observers will be watching closely to see if Greenpeace’s fearless fight to prevent the slaughter of the world’s whales is also now applied to the largest land mammals, elephants. Elephants need logging roads like they need a hole in the head. The two things often come together. Scott Poynton of Tropical Forest Trust, left (with Henri Djombo, Forest Minister of the Republic of Congo, right). What Poynton neglected to mention was that, under the FSC’s absurd ‘Controlled Wood’ Policy, CIB had anyway been able to parcel up wood from ‘dubious’ sources – perhaps including the concessions which are now causing such problems for forest elephants – with wood from certified areas, and sell the whole lot off as ‘Mixed Sources’ FSC labelled. Mixed sources: Lucas van der Walt of CIB was captured in this Reuters video standing by a pile of CIB wood clearly labelled as coming from ‘Mixed Sources’. Readers of FSC-Watch might be wondering why the Rainforest Alliance, which professes to be an ‘international conservation organisation’, should wish to be associated with any company that is even possibly having such impacts on one of the world’s most threatened species. Rainforest Alliance’s Richard Donovan, who has led the development of the organisation’s Smartwood programme seems to believe that the expansion of certification is the overriding priortiy, and has stated how proud he is that he has “created a new industry: independent forest auditing”. However, as this website has constantly reported, there are many unanswered questions about the extent to which a number of the SmartWood-certified companies actually comply with the FSC’s requirements. In fact, the Rainforest Alliance’s IRS return for 2006 (pdf, 1.2Mb) shows that, at $4.75 million, the organisation’s annual income from certification fees (which include a number of other schemes as well as their FSC certificate-issuing department of SmartWood) is almost identical to the organisation’s total salary bill. A dramatic expansion of road building is underway in the Congo Basin fuelled by private enterprise, international aid, and government aspirations. Among the great wilderness areas on earth, the Congo Basin is outstanding for its high biodiversity, particularly mobile megafauna including forest elephants (Loxodonta africana cyclotis). The abundance of many mammal species in the Basin increases with distance from roads due to hunting pressure, but the impacts of road proliferation on the movements of individuals are unknown. We investigated the ranging behaviour of forest elephants in relation to roads and roadless wilderness by fitting GPS telemetry collars onto a sample of 28 forest elephants living in six priority conservation areas. We show that the size of roadless wilderness is a strong determinant of home range size in this species. Though our study sites included the largest wilderness areas in central African forests, none of 4 home range metrics we calculated, including core area, tended toward an asymptote with increasing wilderness size, suggesting that uninhibited ranging in forest elephants no longer exists. Furthermore we show that roads outside protected areas which are not protected from hunting are a formidable barrier to movement while roads inside protected areas are not. Only 1 elephant from our sample crossed an unprotected road. During crossings her mean speed increased 14-fold compared to normal movements. Forest elephants are increasingly confined and constrained by roads across the Congo Basin which is reducing effective habitat availability and isolating populations, significantly threatening long term conservation efforts. If the current road development trajectory continues, forest wildernesses and the forest elephants they contain will collapse. The full paper is available here (pdf, 1.6Mb). Barry – You really can’t help but show yourself up for the time-wasting ignoramus that you are, can you? you people are stupied we really need these elephants to be protected! this is where the goverment should step in and stop the poachers. all of the congo should be humanless and the animals should be left alone.Stop the poachers.An eye for an eye! @tina – “all of the congo should be humanless” is probably the most extreme comment so far on FSC-Watch. Where do you propose evicting people to? What if they don’t want to move? Your approach to conservation seems to be somewhere between Dave Foreman and Pol Pot.